The Camino de Santiago is a mystical path that has been walked over a period spanning many thousands of years. Long before it became a Christian pilgrimage, Celtic Druids of the Iberian peninsula often followed the path of the Milky Way to Finisterre, the point of land that they believed was the end of the known world. It was here that they worshipped the sun at the altar of Ara Solis, believed by many to have been placed there by the Phoenicians long before. The Celtiberians, with their deep connection to nature, held sacrosanct the sun and the moon, and attributed great authority to the spirit of the sea, rivers, water wells, forests and mountains. Finisterre is a place known nowadays for its exquisite sunsets and its spiritual reference to death and renewal. It’s not hard to imagine how the majesty of the sun moved our ancient ancestors to a peaceful space within. Two thousand years later, modern day pilgrims, after completing their pilgrimage to Santiago de Compostela, make the journey to Finisterre. Some honour the rituals of the ancients; they burn their clothes and boots and bathe in the waters of the sea, washing away the past and embracing a new life. They watch the sun as it sinks to its death on the horizon, and as it rises again, feel a deeper sense of renewal. 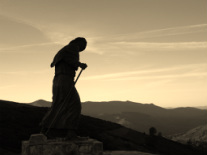 These days, the Camino de Santiago is walked by people of every spiritual persuasion. It is also walked by those who are not religious at all. The route became a popular Catholic pilgrimage only after the discovery of what was believed to be the bones of St. James the Apostle in the area that is now known as Santiago de Compostela. 7th and 8th century documents suggest that after the death of Christ, St. James and his band of missionaries preached in Galicia, and legend has it that after he returned to Jerusalem and was beheaded by Herod Agrippa, his body was put out to sea in a stone boat by his disciples. Guided by angels, it washed up upon the shores near Finisterre, and under the orders of the reigning queen, was buried in the very spot upon which the great cathedral of Santiago now stands. The discovery of St. James bones was only made about 800 years later, after a Galician shepherd claimed to see a vision of a group of stars low in the night sky. According to the peasant, they were shining light on a remote place in the Libradon mountains. Upon investigation by the Bishop of Iria Flavia, the bones of the Apostle were discovered, and later the Camino de Santiago was declared an important Catholic pilgrimage route. Since the publication of a number of popular books on the camino, the amount of pilgrims walking since the 1990’s has soared dramatically. Shirley MacLaine, Paolo Coelho and Carlos Casteneda brought the camino into current public awareness with their own accounts of their personal journeys, and celebrities of different types from other countries followed suit over the years by publishing widely accepted books and TV documentaries that created great surges in public interest. In 2012 alone, almost 200,000 pilgrims from 134 countries arrived to collect their compostelas in Santiago de Compostela. You can get up-to-the-minute statistics from the Pilgims Office in Santiago here. Historians are discovering that many of the Roman roads along the Camino de Compostela were originally built by the Celtiberians and later restored and used by the Romans. The hamlet of O Cebreiro sits atop a mountain in Galicia and is home to many restored circular Celtiberian buildings known as pallozas. This is a place almost lost in time and steeped in history and mythology. The pre-Roman church in O’Cebreiro, containing the Galician Holy Grail. It was here that a Eucharistic miracle occurred. Learn more by clicking on the link below. This hostel, built around 1185 and run by the Order of San Juan de Acre, once provided beds and food for medieval pilgrims.